During the past three decades scholars have made a tremendous effort to study the relationship between High Performance Work Practices (HPWPs) and organizational performance. But comparatively scholars have paid less attention to establish the relationship between HPWPs and various attitudes and behaviors of employees. This paper provides comprehensive review on various types of HPWPs and its link with improving Organizational Citizenship Behavior (OCB) via mediating organizational justice and organizational commitment. The main objective of this paper is to explain how to improve OCB of employees by adopting various HPWPs via mediating organizational justice and organizational commitment. Finally, the paper presents a comprehensive framework which shows the mediating role of organizational justice, organizational commitment between HPWPs, and OCB. 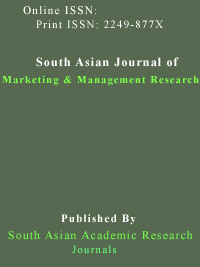 This paper provides further insight, for people who are responsible in handling employees as human resources managers of organizations, on HR practices contribute to high individual level and organizational level outcomes. High Performance Work Practices, Organizational Citizenship Behavior Organizational Justice, Organizational Commitment. Bateman, T. S. & Organ, D. W. (1983). Job satisfaction and the good soldier: the relationship between affect and employee „citizenship. Academy of Management Journal, 26, 587 95. Cohen-Charash, Y., & Spector, P.E. (2001). The role of justice in organizations: A meta-analysis. Organizational Behavior and Human Decision Processes, 86, 278-321. Farh, J., Posdakoff, P. M. & Organ, D. W. (1990). Accounting for organizational citizenship behavior: Leader fairness and task scope versus satisfaction. Journal of Management, 16,705-721. Greenberg J (1990). „„Organizational justice: yesterday, today, and tomorrow‟‟. Journal of . Management., 16: 399-432. Liljegren, M. & Ekberg, K. (2009). The associations between perceived distributive, procedural, and interactional organizational justice, self-rated health and burnout. Work, 33, 43-51. Konovsky, M. A., & Organ, D. W. (1996). Dispositional and contextual determinants of organizational citizenship behavior. Journal of Organizational Behavior, 17, 253–266. MacKenzie SB, Podsakoff PM & Fetter R (1993). The impact of organizational citizenship behavior on evaluations of sales 1926 Afr. J. Bus. Manage. performance. J. Mark., 57(1): 70-80. Meyer, J. P., & Allen, N. J. 1984. Testing the "side-bet" theory of organizational commitment: Some method- logical considerations. Journal of Applied Psy- chology, 69: 372- Journal of Politics, 27: 735-760. Moorman, R.H. (1991). Relationship between organizational justice and organizational citizenship behaviors: Do fairness perceptions influence employee citizenship? Journal of Applied Psychology, 76, 845-855. Organ DW (1988). Organizational citizenship behavior: The good soldier syndrome. Lexington, MA: Heath. Organ DW, Lingl A (1995). Personality, satisfaction, and organizational citizenship behavior. J. Soc. Psychol., 135(3): 25-31. O‟Reilly, C., & Chatman, J. (1986). Organizational commitment and psychological attachment: The effects of compliance, identification, and internalization on prosocial behavior. Journal of Applied Psychology,71, 492– 499. Podsakoff PM, & MacKenzie SB (1997). Impact of organizational citizenship behavior on organizational performance: A review and suggestions for future research. Hum. Perform., 10(2): 133-151. Podsakoff PM, MacKenzie SB, Moorman RH, & Fetter R (1990). Transformational leader behaviors and their effects on followers‟ trust in leader, satisfaction and . organizational citizenship behaviors. Leadersh. Q., 1(2): 107-142. Smith CA, Organ DW, & Near JP (1983). Organizational citizenship behavior: Its nature and an. tecedents. J. Appl. Psychol., 68(4): 653-663. Sweeney, P.D., & McFarlin, D.B. (1993). Workers‟ evaluations of the “ends and the “means”:An examination of four models of distributive and procedural justice. Organizational Behaviorand Human Decision Processes, 55, 23-40. Van Dyne L, Graham JW, & Dienesch RM (1994). Organizational Citizenship behavior: Construct redefinition, measurement, and validation. Acad. Manage. J., 37(4): 765-802. Vishal Gupta & Shailendra Singh(2010) Developing set of High Performance HRM practices and Exploring its relationship with OCB and Organizational justice SMA 2010, Proceedings –pp 464.